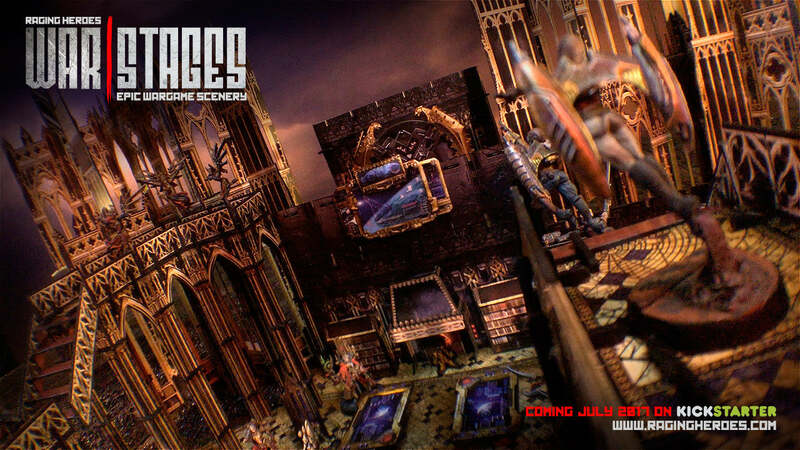 WarStages is THE Scenery System for 28mm scale miniatures you've been waiting for: Ultra-Modular, Epic, Flexible, Gorgeous! 681 backers pledged $202,618 to help bring this project to life. Thanks again. You’ve made this campaign, our 3rd one, a real success! 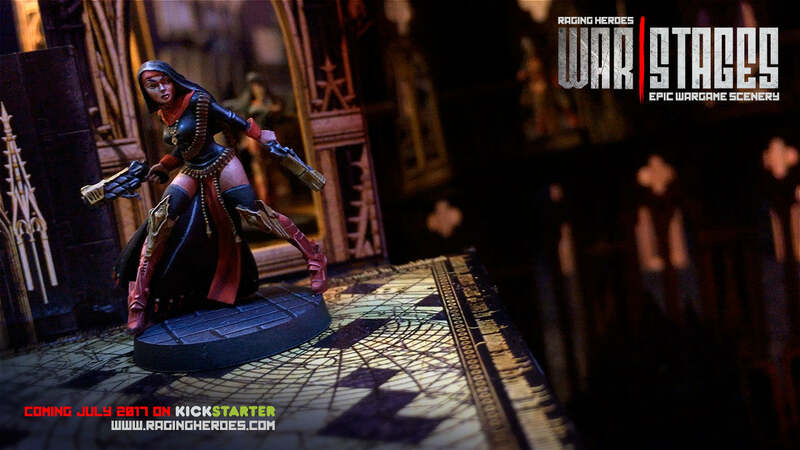 We funded in 16 mins and the final score of this 7-day campaign places WarStages in the top tier of scenery Kickstarters! AND this was done in just one week! You’ve been a wonderful set of people and we’ve learned a lot from your questions and feedback. It has been a pleasure to interact with you and, once the dust settles, we’ll do everything we can to add little improvements here and there to the Cathedral and the Daedalus, one last time before sending it to the printer. Of course we’ll keep you posted with updates . If you were short on funds during the campaign, or if you just discovered the campaign, we are setting up a late pledge page. Click on the Red button above: ‘You can Still Pledge’. Choose your pledge level to select the cathedral size you want. When Add Ons are unlocked (the Gothic Daedalus Extension, the Gaming Mat, etc.) you can pledge extra money to add one or several of them to your pledge. Please note that you MUST pledge for one of the Cathedral Kits to get access to other ADD-ONS. It’s Gonna be a Limited Edition: Due to the way the printing industry works, we’ll do only one run, as large as possible to keep costs down. But once it’s gone, that will be it. Stretch Goals: Freebies and more Freebies: 95% of the Stretch Goals planned for this campaign will be Freebies, so get ready for the ride! And that’s not all. The bigger you pledge, the more Freebies you’ll get! Which Kit Should I Pledge For? Small, Medium, Large or Extra Large Cathedral? Do you also need the Gothic Daedalus Extension? Know that MEDIUM Cathedral + 1 Gothic Daedalus Extension is what we used in all our images and videos. When you choose this kit or the larger ones, you know that you are getting at least one of each of the Bricks and Stages that we designed. Much More than a Gigantic Cathedral: Stunning, Modular, Immersive, Practical, Great Value. 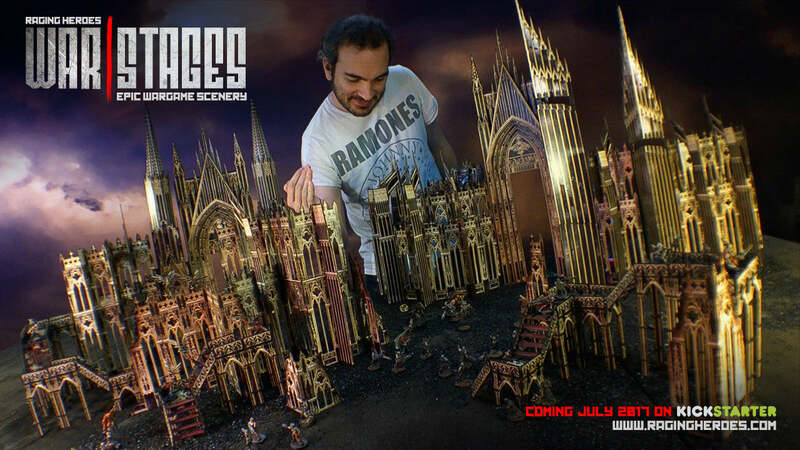 You don’t need to paint it, you can turn it into nearly any type of building you want, this is the ultimate scenery kit! 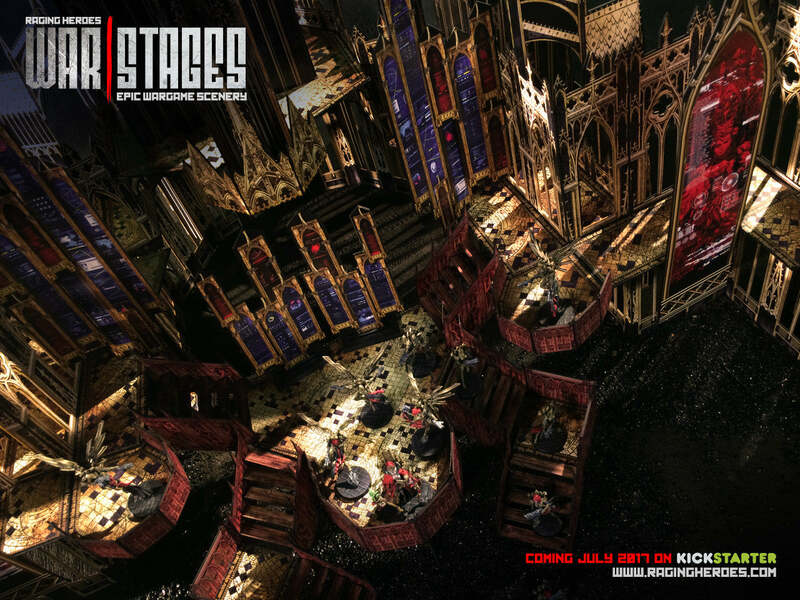 The WarStages Concept: WarStages are made of BRICKS, CLIPS, and STAGES. Assemble the BRICKS (basic elements like floors, walls, etc.) 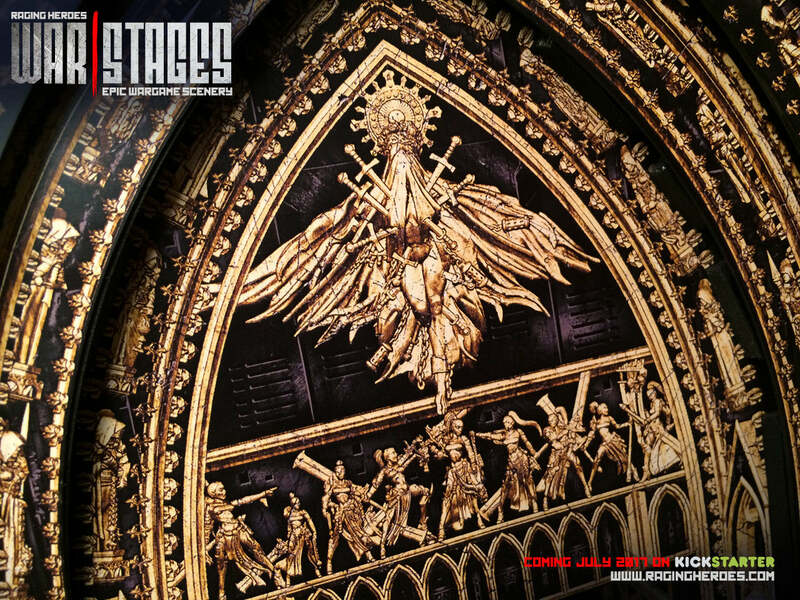 with a few CLIPS to build large architectural elements: the STAGES. Move the Stages around to completely transform your gaming table in less than a minute: infinite layout possibilities. Assembling CLIPS, BRICKS and STAGES: Our uniquely designed CLIPS allow for a crazy amount of modularity. Slide them between 2 BRICKS and they nearly disappear. Scroll down to this section and DON’T MISS our 2 VIDEOS about this. What is it made of? 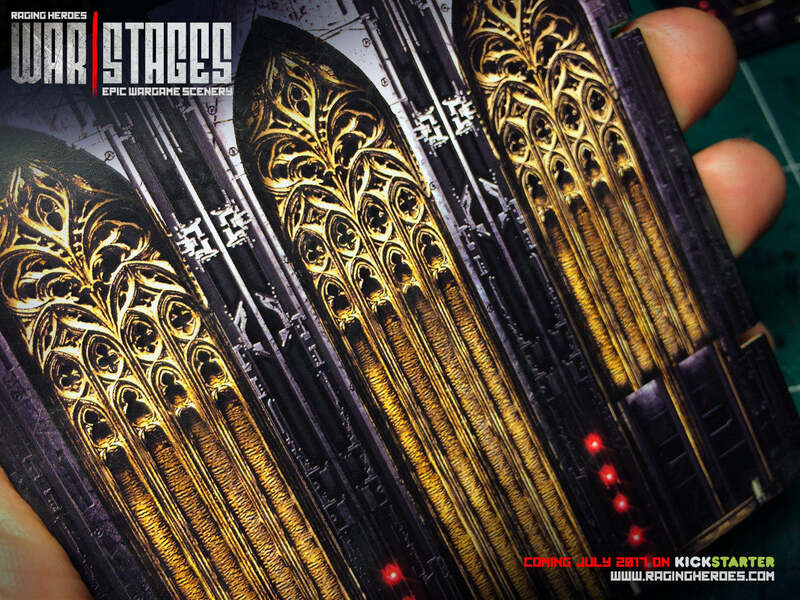 The WarStages kits are made of 1.8mm thick high-quality super-dense coated colour-printed pre-punched cardboard. Once it is assembled with our Plastic clips, it creates super sturdy structures. We chose this material after over a year of testing all possible options. Big as a Convention Display for a Fraction of the Price: Have you ever dreamt of owning one of these amazing convention display centerpieces? Now it is possible at a fraction of the cost and time. 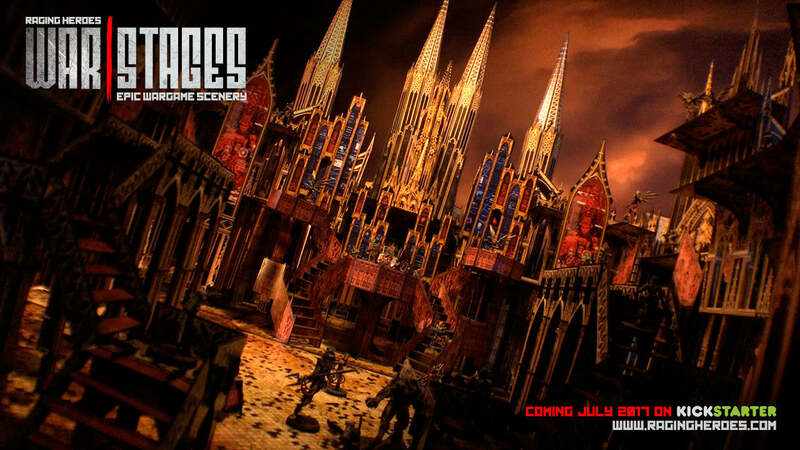 The WarStages scenery is so immersive that each of your game will feel like a blockbuster movie! Customisation, Accessories, Furniture: With a vast array of accessories and furniture to be unlocked and the nearly infinite possibilities of our modular system, you’ll be able to customise your gaming table like never before. Prototype: All the images you see have been made with hand-crafted prototype. Some images were not made using the final designs of our clip. Watch the Assembly video to see the final look of our clips. Playability: With such a wide range of customisation, you’ll be able to use your WarStages and Daedalus Extension for any type of games: gigantic apocalyptic battles, regular mass combat, skirmishes, RPG, and, why not, even jazz up your board games with tri-dimensional terrain. It’s All in the Details: We spend countless hours sculpting the entire Cathedral in 3D to achieve super deep and detailed textures that really pop out. We went even further with the Furniture. It looks like small jewels on the gaming table. It’s a 7-day Campaign: Kickstarter campaigns tend to be exciting at the beginning and at the end, so we trimmed the fat and kept the best parts so that you get an exciting ride and watch your Rewards grow with new Freebies unlocked every day. Shipping: Please budget approximately 10 to 15% of your total pledge amount for shipping. We will only collect shipping fees when we are getting close to ship. This way, we don’t immobilise your funds unnecessarily. Next Steps after the Campaign / Terms & Conditions / Risks and Challenges / FAQ: Scroll down to see what they are. Here are two videos that shows how the system works. First let’s see how to use our various CLIPS to connect the BRICKS together to build STAGES in the first video. And then in the second video, see how easy it is to move the STAGES around your table to create many different layouts. Of course, keep in mind that you are by no mean limited to the STAGES structures we came up with. You can assemble the BRICKS to make completely different types STAGES and completely customise your scenery to build nearly anything. You can see how many Freebies each Pledge Level gets on the Unlock Road Map and on the Freebies list (updated daily). For example, if you look at the Combat Crate Freebie, next to it you can see S, M, X and XL each followed by a number: this is the number of Free Combat Crates you get when you pledge for a Small (S), a Medium (M), a Large (L), or an Extra-Large (XL) Cathedral. 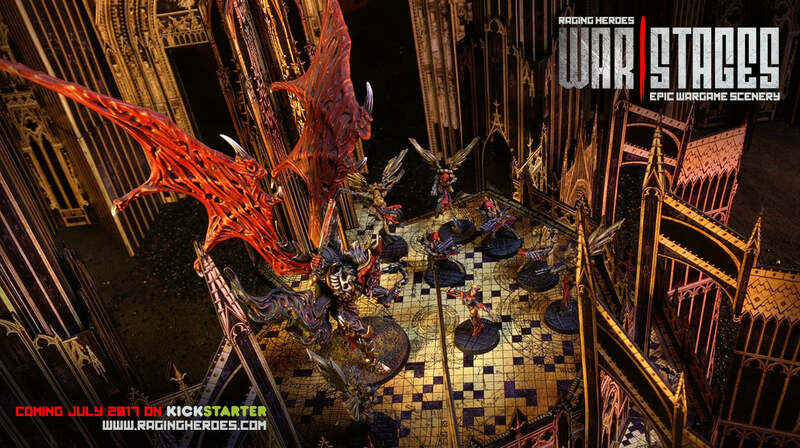 With 4 sizes of Cathedral kits and the Gothic Daedalus extension to be unlocked soon, you may wonder which pledge is right for you… Here is a quick guide. A very beautiful piece of scenery that has the same level of details and quality as its bigger counterparts. However, it doesn’t have as many wall sections as the other kits. So it would work to make a centrepiece that would be perfect for Siege Scenarios. Alternatively, you can break down its various Stages and scatter them on your table and have large elements to block lines of sight, or to be used as snipers’ nests. Another option would be to expand the SMALL kit with the Gothic Daedalus to add more pathways and labyrinthic sections on your table. A different approach would be to get 2 Daedalus Extensions and one SMALL Cathedral kit to achieve a sprawling environment with several landmark elements that you could build with the Cathedral component. This is the kit that we’ve used in all our images and videos. When you choose this kit or the larger ones, you know that you are getting at least one of each of the Bricks and Stages that we designed. It instantly creates a striking gaming environment just by its sheer size. The amount of options and combinations that you get just by moving around the Stages of this kit are pretty insane (see our Stages video below). And of course, you can break down your Stages in smaller or different layouts that will give you even more options to set up your table in just a minute. To us, this kit allows you to do anything: Skirmish, Siege, Mass Combat, etc. Add to this one Daedalus Extension or two and you are then only limited by your imagination. It gives you a large amount of options to expand and transform the Cathedral Stages into sprawling labyrinthic environments. This could be gothic ruined cities, space ship interiors, ‘Name of the Rose’ style gigantic libraries, the list goes on. Channel your inner engineer/architect/game designer and get something you’ve never seen before on your table. Now we’re getting serious. The LARGE kit is great for you to run massive games, or have loads of assembled Stages options at your disposal. It gives you all the options of the MEDIUM kit but pumped up to the next level, and also with many more Freebies. Unless you are interested in only having massive pieces of architecture on your game table, we would highly recommend at least one Gothic Daedalus Extension, and 2 would definitely make sense. With that type of setup, you’re equipped to host a special event at your local shop, at your gaming club, or even in a convention. Are you a space overlord who reigns over thousands of planets? Then this will make a nice crash pad for your weekend getaways :). Seriously, this thing is huge. And it’s pretty obvious that there’s nothing like it available on the market, especially at this price! If you’re interested in this kit, you probably know what you want to do with it. Whether you’re planning to use it as-is in its Cathedral form, or to break it down in many Stages for your table(s), the options you get and the number of Freebies you’ll receive sky will sky rocket. If you plan to use it with the Gothic Daedalus Extension, it would make sense to get at least 2 of these, possibly more. → Do you need a FLOOR MAT? Please note that the mat that you see in our images and videos is a smaller version prototyped on paper. It’s entirely up to you. It is nice because it instantly transform any kitchen table in a gaming landscape with no effort whatsoever. And it certainly adds atmosphere. Since our kits can cover such a wide gaming area, we have looked for the best options to make a Floor Mat that would easily adapt to various table sizes and configurations. For that reason, we chose a quality fabric material. We know that foam/rubber backed materials are very popular, but the problem with this is that they can’t hang over the table’s edges on the day you decide to have a smaller sized game. Since our WarStages allows you to play on the smallest to the largest tables, we wanted a floor mat that would adapt to any situation. → Do you need the DAEDALUS EXTENSION? The Daedalus Extension adds a lot of versatility to your WarStages Cathedral. Thanks to both its low (2 in/5cm) and high (4in/10cm) walls, which you can also easily stack up for more height, you can create enclosed rooms and corridors. The arches, stairs and platforms allow you to create 3-dimensional labyrinthic structures that will probably remind you of Esher or the Monument Valley game. It is a truly fun environment to play with in all types of games, and even more so if you’re playing skirmish and RPG. Of course, you can mix and match the elements of the Cathedrals and of the Daedalus together, thanks to our clip assembly system. With the WarStages system you can play all types of games: Siege, Urban Warfare, Skirmish, Exploration, etc., with a single kit. STUNNING: For the first time ever, your chance to get a gaming table as awesome, big, and epic as a convention center piece. MODULAR: Make it yours! Assemble the Gothic Cathedral, reorganise its layout to your likes, or completely re-invent your own WarStages thanks to our super modular assembly system. IMMERSIVE: Immerse yourself in a movie-like environment with loads of accessories that bring an unprecedented sense of atmosphere, scope and epicness to your games. PRACTICAL: Easy to assemble, easy to store, no painting required. 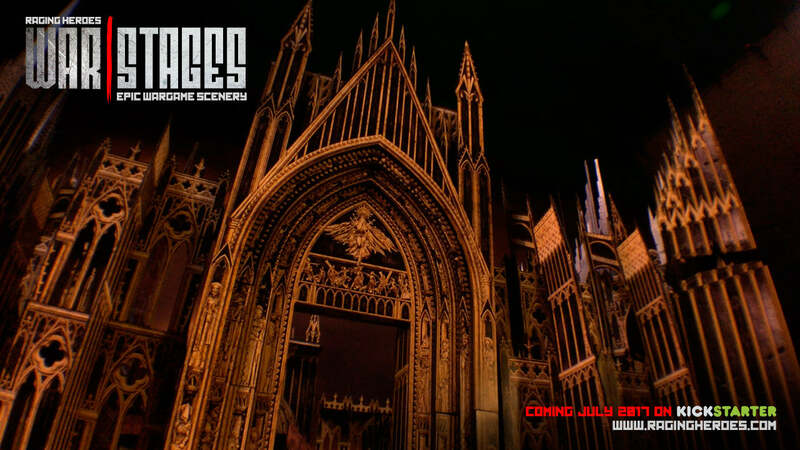 GREAT VALUE: In our survey, you told us that you wanted great value for money, so not only are you getting the most insane gothic scenery ever at a great price, but it is super modular, infinitely customisable, epic as a convention table, immersive as a movie set, and ultra practical, quite easily giving you the best possible of bang for your buck! Modular terrains are great, but re-building everything from scratch every time you need a change is time-consuming and tedious. The Stages are structures made of these Bricks. Each Stage is a building structure that can stand on its own and has a specific function: main portal, choir, bell tower, wall section with catwalks, etc. 3. Move the Stages around to create any other setting you might need. The full Cathedral kit is an assembly of several Stages. Put them together to make the Cathedral... or nearly anything else in just a few seconds. This is because we have conceived each Stage in the Cathedral Kit to have a different type of architectural and gaming function: large portal, catwalk structure, wide platform, enclosing wall, etc. Once you have these Stages ready, it's super easy to either assemble the full cathedral or organise the Stages to set up a fortress, a city in ruins, a giant gothic complex, or whatever you can think of... just by moving the various sections around. But since the Bricks are entirely modular, you can also forget our design and completely customise or create your own. It is super easy and open even more possibilities! Play outside, play inside the scenery you create, or even use it as a mighty skyline for your table. Every picture you can see on this page / in our communications has been made this way with a single MEDIUM Gothic Cathedral kit (in most cases less than a full kit) and, on some set-ups, we added a few elements of our Gothic Daedalus extension kit to extend some of the stages with more passageways, arches and new types of walls. This was very quick too! We have assembled our Stages then moved them around to create many different set-ups, each time it took less than a minute! The Gothic Daedalus kit is a structure kit made of another set of 'Bricks'. It is conceived to expand, complexify or connect the various stages of your Cathedral kit. You can also use it on its own to create intricate multilevel structures and even entire rooms! 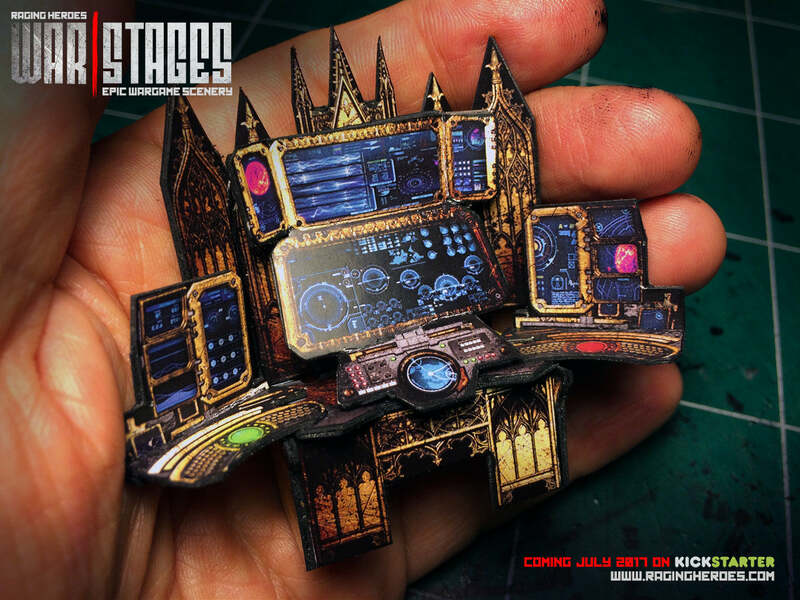 Once you'll get used to your WarStages kits, it won't take long before you invent your own Stages by mixing the WarStage Bricks your own way, creating your own vocabulary of building structures to even better match your gaming needs and your personal taste. During our one-year journey in the development of WarStages, we tried A LOT of things, both technically and artistically. And we came to a conclusion that may surprise some of you: the most effective, good-looking, affordable solution to build our large-scale epic scenery was the use of high-quality, 1.8mm thick, super-dense, pre-punched, coated, color-printed cardboard. You can judge by yourself how good it looks in our video and photos on this page. With more than 3 linear meters (120 linear inches) of walls and towers on several level, our Medium kit is already truly massive. The highest towers stands about 30 inches high (75cm), that's more than 20 minis standing on top of each other ! All of us gamers put a lot of effort in assembling, painting, converting our minis to make our armies look special. But when the minis are laid out on the table, the first thing you really see is the table and the scenery. 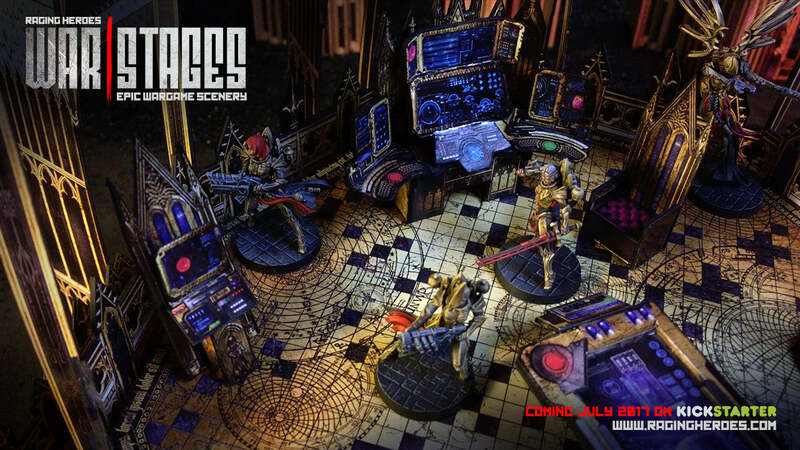 WarStages gives you a convention-looking table with minimal effort and cost so that your games will never look the same again. With such a jaw-dropping looking table, you'll host the most memorable games and you and your friends won't get enough of it. Here you have about half a Cathedral and a few Gothic Daedalus passageways. 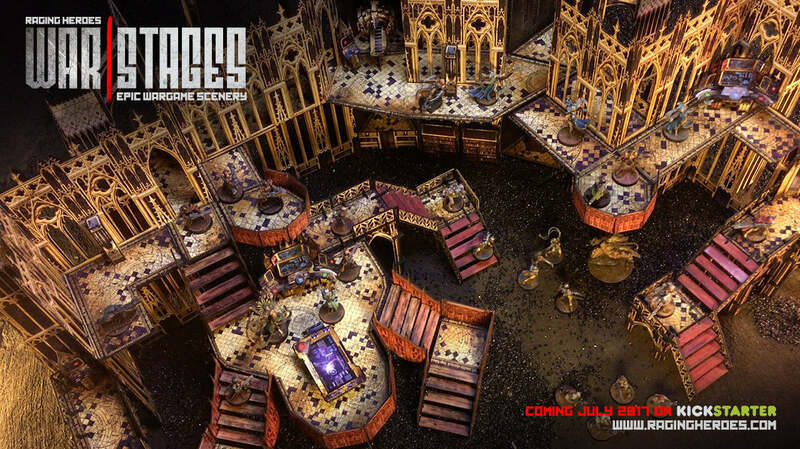 Because the WarStages is so modular, you'll be able to create a vast range of structures, rooms, and buildings. By mixing the Cathedral kit with the Gothic Daedelus Extension, you'll have at your disposal many options of open walls, closed walls, stairs, floors, etc., of all sizes and shapes to create anything you want. You can create 3D game boards for your favorite board games, indoor/outdoor structures for skirmish and exploration games, large size city ruins, etc. 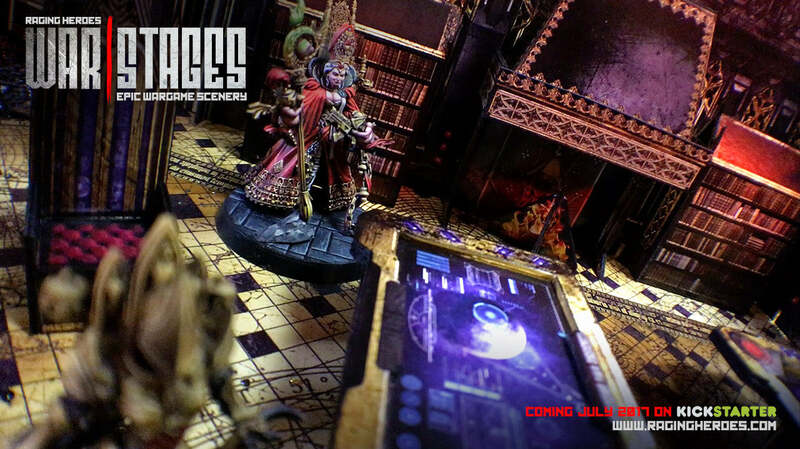 You could even use your WarStages kit as a display piece to showcase your minis in your display cabinet! On top of that, you'll have access to a wide selection of furniture and accessories like computer consoles, crates, containers, and even medical scanners, ventilation systems, and more. Each of these accessories is incredibly detailed, and combines a very elaborate gothic design with sci-fi technology. These small elements really bring the scenery to life in a unique way. Which goes to show how much time and effort this WarStages kit will save you. Because this prototype that we show you was all made by hand, you might spot a few misalignments here and there that won't be in the final product, of course. It is also why many elements of the cathedral don't feature clips in the photos, since many Bricks are glued together on our prototype. Also, the clips you see here are also prototypes that have since been adjusted to become nearly invisible (more on this in the next few days). But photographing the Cathedral assembled with glue gives allows you to see the look you can achieve if you choose to completely glue rather than clip the Bricks together and not disassemble your various Stages, which is certainly another option available to you. Of course, playability has been one of our main focus from the start. The infinite modularity of the WarStages components makes you certain that you can create anything you might need for your various games. If you just follow our instructions to build the Cathedral, you end up with loads of walkways, covers, etc. But you can even push it further and completely customise your terrain to perfectly fit the specifics of each of your games, creating more covers, labyrinthic setups, symmetric tables for tournaments, the list goes on. And the vertical arrangement of the various levels means you get even more game space on a single table! We spent A LOT of hours crafting detailed textures to dress up the Cathedral and the Gothic Daedalus. Most of them were 3D-sculpted first to be sure that you'd get a maximum sensation of depth and volume. Then we carefully added and altered photographic textures for even more richness and realism. On the Great Portals of the cathedral, you'll find many sculpted ornaments and statues. If you're already familiar with our Sisters of the Eternal Mercy, you'll recognise many of them in medieval-style sculptures, as it used to be done on churches and cathedral doors at that time. A close view of the Gothic Daedalus Extension wall. Once again, we've made a subtle blend between gothic elements and Sci-Fi features. You can see here a computer console: it is full of panels engraved with gothic tracery combined with super detailed retro high tech components. They'll look as intricate as jewels on the gaming table. 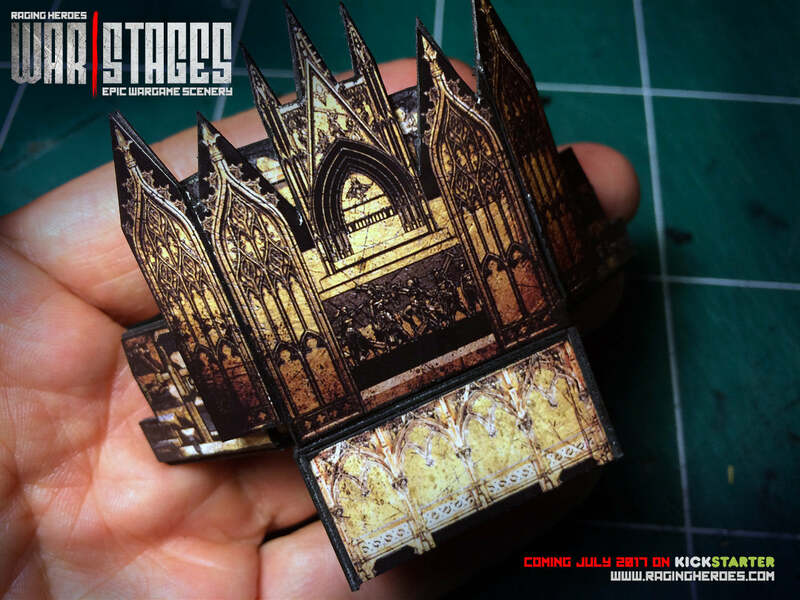 As the WarStages - The Gothic Cathedral Kickstarter is just a few days from launching, you need to know that the Cathedral and the Gothic Daedalus will be a limited edition. Making cardboard scenery means working with the printing industry. And the printing industry works with “runs”. To achieve a reasonable price on any printed item, a printing company has to run a large quantity of each item, otherwise the prices skyrocket. This is due to the fact that printing has some pretty heavy setup costs. So what does that mean for you ? After the crowdfunding ends and once you’ve completed your Rewards selection, we will print what is needed to fulfill that. We’ll order a bit more surplus to have some stock leftover for retailers, as well as spare parts, etc. However, we won’t order more than that because stocking hundreds of these kit will take a LOT of space. So once that surplus is gone, it is sold out. And in all likelihood, there is little chance that we get enough demand afterwards to be able to do another run of the Cathedral and the Gothic Daedalus. Standing behind the onyx and gold steel walls of the Sisters' sacred sanctuary, an officer inspects the sprawling battlefield before the final stand. An Iron Empire sniper perched on the third floor aims at just-landed Icariates on the opposite platform. Here we simply re-arranged a few Stages of the Cathedral and added some walkways and stairs from the Gothic Daedalus Extension; in a few minutes, you go from an actual Cathedral building to a labyrinthic structure perfect for skirmishing. Did you say tall? The Cathedral Stages are full of birds' nests for your snipers and landing platforms for your flying troops. Remember the great games you played? The ones where the deployment phase didn’t drag on forever, the dice rolls were great, the moments, epic? When everybody had such a great time? Well, we want this campaign to feel the same for you. We want it to be exciting, with unlocks everyday. We all want to skip over the weeks in the middle where nothing really happens and you start to wonder “Is this going somewhere?”. It's summer, so let’s make this a unique moment where things keep moving all the time, where you'll see your pledge get bigger and bigger with freebies. And when it is over you'll think “It was short, but boy, it was great!”. We have learned quite a lot from our first two Kickstarters, The Toughest Girls of the Galaxy and TGG2: Light&Darkness.They were both successful beyond our wildest expectations. This forced us to grow and adapt at a very fast pace. We made some errors along the way, but we're only stronger for it. With that experience under our belt, we have continually resigned and improved every single process of our workflow: the creative work, the manufacturing, the logistics, etc. However, the vast majority of our backers feel extremely pleased with the way we handled this, and praised us on keeping our focus on quality rather than speed. So this time, we did 2 things differently. First, we completely designed and tested the product BEFORE launching our project. Then, we decided to move from a craftsman production to an industrial one. This means that what is now left to be done is essentially the manufacturing, and that the manufacturing will be taken care of by large companies who are known to routinely produce and deliver this kind of product. That being said, when you back a Kickstarter, you embark on a great adventure. You get a unique chance to ride side-by-side with the project's creators, and see from the inside how a project is brought to life. This can be very thrilling as new stuff comes along, and better than expected results are achieved. But as in every adventure, the sea does get rough sometimes. By being a backer, not only do you get to get a feel for the highs and lows the project creators must live through. You get a very real opportunity to celebrate the wins, but also, to support the morale of the project team and make a difference when things are challenging. Kickstarters are projects in development. They are not pre-order shops where the unknown doesn’t have its place. You might not want to take part in an expedition that may include risks and delays and a little bit of rough seas, and this is all well with us. We cannot guarantee anything except that we'll do our utmost best. But if you don't mind a little drizzle and you want to live the adventure together with us and be part of the creation of something great, if you want a bit of the unknown and watch this awesome terrain take life, if you love to experience unexpected good turns, great art and the companionship of an amazing band of backers, then do come aboard, we are setting sails! We have borrowed these Terms and Conditions from our friends at Cool Mini or Not, as we couldn’t have said it better. You confirm that you are clear that this product is not a toy and is not intended for children under 16 years old. Notes: If you want Add-ons, simply increase the amount of your pledge. Shipping will be charged after campaign ends (see Shipping section for details). Get the Medium version of the Cathedral + the Medium kit of all the Unlocked Freebies. Get the Large version of the Cathedral + the Large kit of all the Unlocked Freebies. Get the Extra Large version of the Cathedral + the XL Kit of all the Unlocked Freebies.